Get lost amidst green meadows, cloudy hilltops and wind rocks at Horsley Hills, located about 534 Km from Hyderabad. The Monsoons are usually fantastic here. So go now! Wake up to foggy mornings and lush green forests at this scenic hill station. 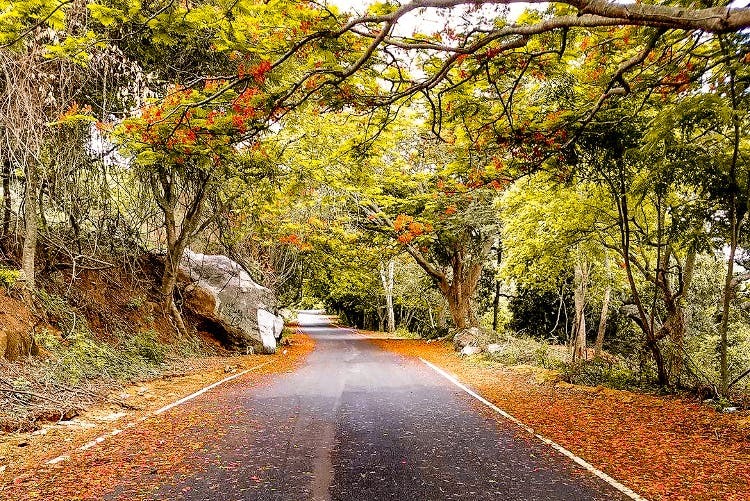 Horsley Hills is one of the few non-commercialised picturesque places in Andhra Pradesh, where you can spend an entire day basking in the natural beauty. Drive up the hills to breath taking view points, and sit in solitude during dawn (or dusk). You can also witness the flora and fauna (chirping birds and monkeys will surely entertain you) of the region in their natural habitat. While the Gali Bandalu (wind rocks) are popular, don't forget to check out the many unexplored but beautiful destinations around the area like the backwaters of Gangotri Lake, the ruins of Chennakesava Temple, and a 150-year-old Eucalyptus Tree called Kalyani. Being a 10-hour drive from Hyderabad, we recommend going on a road trip and spending an entire day exploring the place. While here, stay at Horsley Hills Haritha Hill resort, and unwind like a boss. There are no guided hiking or trekking tour of the forests, which could make it a bit intimidating to roam the place.